and his family for many years. according to the 1920 Census. The area at right marked "Detail Map" is seen with schooling records. This map shows where Laraway Ave. is, being in NW corner of section 17. 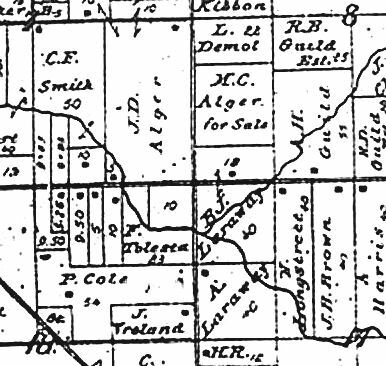 The 1876 plat map at left indicates the B.J. Laraway owned the whole east side of Eastern Ave., on both side of 28th street. The current 1998 satellite photo below can give you the idea of what great creeks the kids had to play in.